We've got a strong amendment which is based on consistent views over a number of years from Labor about emissions trading. Can he be serious? Let's examine the party's positions. Labor knows that to propose/support a carbon tax going into an election would lose votes and probably lose the election so we have seen Labor's position about face post elections. Climate change is not just an environmental challenge. It is so great we should be at the stage now in this country where climate change is beyond politics. However after the ClimateGate emails exposed the hoax and Man Made Climate Change got a beating at the Copenhagen Gabfest, Kevin Rudd ran dead on the issue. 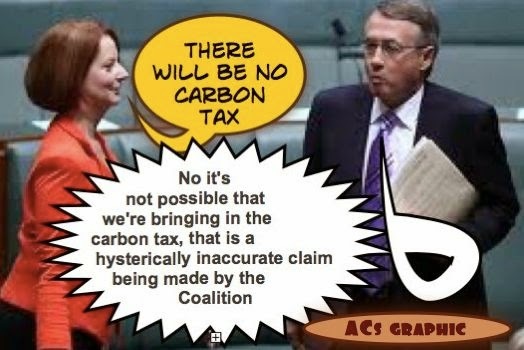 The Carbon dioxide tax was introduced by the Gillard Government at $23/tonne and became effective on 1 July 2012. It increased to $25.14/tonne on 1 July 2013 and to $25.40/tonne on 1 July 2014. "The argument [behind climate change] is absolute crap. However, the politics of this are tough for us. Eighty per cent of people believe climate change is a real and present danger." Tony Abbott now claims to take climate change "very seriously"
Whether Abbott's presumed new position was a political stance or not doesn't really matter as he still maintained Renewable Energy Targets, still talked of carbon abatement and he appointed the warmist Greg Hunt as Minister for the environment. 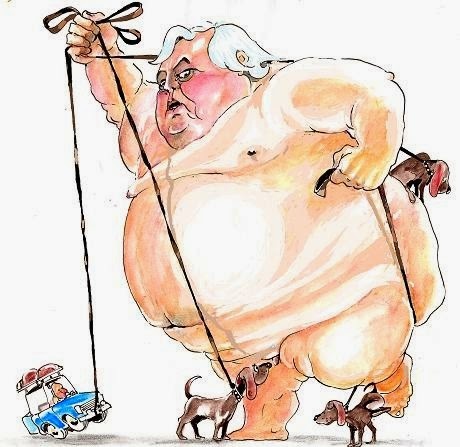 Before the 2013 Election, Clive Palmer said he was for the repeal of the carbon tax, however he changes his position more times than a baby changes nappies and for the same reason. Clive's new amendment had to be generated from the Lower House and the Reps won’t sit until next week. Oh dear, what a balls up. Clive immediately went into Clive mode claiming the Government had, “pulled a swifty”. Of course the Government hadn’t pulled any bloody thing, it was Clive doing all the pulling and it wasn’t just swifties. He clearly hadn’t realised what he’d done. Nor did the Press (well, you can understand the Press gallery not understanding anything). The NO CARBON TAX Climate Sceptics have constantly opposed any form of tax but have had their political success thwarted by false promises and changes of position. In 2009, NCTCS (although not yet approved as a party by the AEC) contested two by election. The Pro-Carbon Tax Malcolm Turnbull had just been replaced by Tony Abbott and many of our supporters returned their vote to the LNP Coalition. By the time of the 2010 Election, it seemed unnecessary for voters to support NCTCS because both major parties were saying "NO CARBON TAX." Again at the 2013 Election both major parties were saying "NO CARBON TAX." 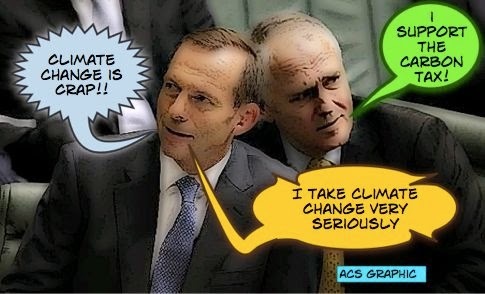 If only the voters hadn't been sold a PUP, perhaps NCTCS could have swayed Australia away from the fraud of the man made Global Warming Hoax. It's unfortunate that you've misquoted Tony Abbott in the meme. He had said, "the SCIENCE of climate change is crap". Totally different meaning. Sorry David. I linked to the original report and the quote is directly from that link.